Rate and review Garage Doors Richardson in Dallas, TX, United States! 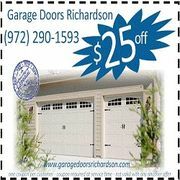 Share your experiences at Garage Doors Richardson with your friends or discover more Home and Garden in Dallas, TX, United States. ★★★★★ I always have positive experience with your company. I just wanted to tell you how much I love your company and service!